For all its variety, when most people speak of "crystals", they are usually referring to Rock Crystal (Clear Quartz), the six-sided prisms of pure light and energy known as the Perfect Jewel. In its sparkling light is contained the entire color spectrum. In the metaphysical world, Clear Quartz crystals are the supreme gift of Mother Earth. Even the smallest is imbued with the properties of a master healer teacher. Ancients believed these stones to be alive, taking a breath once every hundred years or so, and many cultures thought them to be incarnations of the Divine. Quartz encompasses a whole family of stones, found on nearly every continent, in virtually every color conceivable. In addition to the properties of Clear Quartz discussed on this page, the following types of Quartz have their own specific properties, some with links to their own pages. Macro crystalline varieties form crystals or have a macroscopical crystalline structure. They are usually referred to as "Quartz." 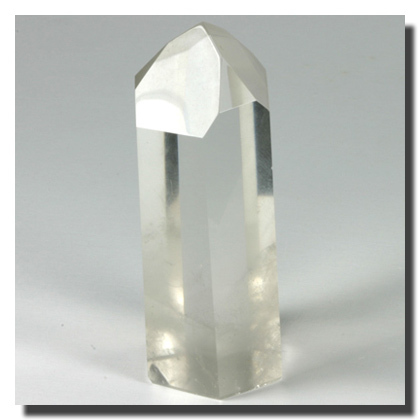 Rock Crystal is pure, clear Quartz, often with a milky base. Its properties are listed on this page. Amethyst is pale purple to deep violet; known as the Bishop's Stone, it represents royalty and spirituality, and is a crystal of creativity. Ametrine is a combination of Amethyst and Citrine in the same stone; a "stone of the muses," it connects spirituality, action and overcoming fear. Aventurine may be green, blue or reddish-brown with a metallic iridescence; it is a stone of optimism, leadership and prosperity. Blue Quartz is clear Quartz with tiny blue inclusions that create a pale to mid-blue color; it brings harmony and order, mental clarity and eases fear. Citrine is transparent and pale to golden yellow; it promotes imagination and magnifies the powers of personal will and manifestation. Milky or Snow Quartz, also known as Quartzite, is opaque white quartz; it is supportive for lesson learning, realizing limitations and utilizing tact. Pink Quartz forms in rare clusters of small, well-formed crystals, pale to deep reddish-pink, translucent to transparent; a “stone of innocence and discovery,” it nurtures self-love and respect of others. Rose Quartz is a massive form of Quartz, pale to deep reddish-pink, opaque to translucent; a “stone of beauty and love,” it promotes compassion, appreciation and soothing calm. Prase is a leek-green Quartzite (rock rather than a mineral) with actinolite inclusions; an "earth mother" stone, it resolve conflicts and calms nerves. Prasiolite is Green Amethyst; leek-green and rare naturally, it is often heat-treated; it provides a bridge between the body, mind and spirit. Smoky Quartz is transparent smoky brown to dark gray; it is a premiere grounding stone, dissipating emotional and environmental negativity. Tiger's, Hawk's, and Cat's Eye is Quartz layered with chatoyant strips of asbestos and hornblende; Tiger's Eye is golden brown, Hawk's or Falcon's Eye is blue-black, and Cat's Eye is green to greenish-gray. These are stones of action, pride, protection, and reflecting back negative energies. Cryptocrystalline or microcrystalline varieties have a dense structure and show no visible crystals. They are often grouped together and referred to as "Chalcedony." They are divided into two groups. Agate is usually banded in layers and forms in every color; it is a stabilizing and strengthening stone, facilitating acceptance of one's self. Carnelian is translucent pale orange to deep red-orange; it is a stone of motivation and endurance, leadership and courage. Chalcedony varies in color and pattern, blue is a favorite; the "speaker's stone," it encourages peace-making and carefully choosing one's words. Chrysoprase is green, usually opaque, and one of Chalcedony's rarest; it is a stone of the heart and promotes love of truth, hope and fidelity. Onyx is opaque layers of black, brown, gray, black/white or red/white, and is often carved in cameos; it provides inner strength, stability and fortitude. Sard is brown Chalcedony with a reddish hue; it is a protective stone, dispelling negative influences and providing inner strength. Chert is brown, gray or black and resembles Flint, but is more brittle; it aids memory, and is a stone of stability and daily productivity. Flint is brown, gray or black, solid or layered, and very hard; a stone of grounding, it promotes understanding, communication and integrity. Jasper is opaque, large-grained and found in all colors, most always layered or patterned; a "supreme nurturer," it is revered as sacred, protective, and encourages humility and compassion. Heliotrope or Bloodstone is dark green with red spots; a stone of the sun and legendary bearer of Christ's blood, it promotes healing, selflessness and idealism. This list of main Quartz types is in no way complete. For 500 different shapes, types, and varieties of Quartz Crystals that are constantly being updated on this site, go to Quartz Crystals A to Z. Clear Quartz is particularly useful for stimulating the Crown Chakra. The Crown Chakra is located at the top of the head, and is our gateway to the expanded universe beyond our bodies. It controls how we think, and how we respond to the world around us. It is the fountainhead of our beliefs and the source of our spirituality. It connects us to the higher planes of existence and is the source of universal energy and truth. When the Crown is in balance, our energies are in balance. We know our place in the universe and see things as they are. We are unruffled by setbacks, knowing they are an essential part of life. Quartz is the crystal connection to the infinite octaves of light. Quartz encompasses the Universal Life Force manifested in light. It is the pure White Light of creation manifested in crystalline perfection. It is the higher state of Light, a looking glass of the soul, and the reflection of the Light beings blessings on mankind. Clear Quartz with its purity of Light is particularly appealing to angels. If your birthday falls in any of the following periods, a Clear Quartz can be a valuable conduit to your Guardian Angel. The table also provides the name of the Guardian Angel of those born in the time period. There are other Angels that are partial to Clear Quartz.. The table below gives you the information about them. Quartz honors Gaia, the Greek Earth Mother Goddess. Born directly out of Chaos, the primal emptiness, she was the first (or one of the first) beings to appear during the process of creation, and is honored as being the Earth itself. Clear Quartz honors Kundalini, the Hindu Life Force Goddess; Latona, the Roman Goddess of Light; and Gendenwitha, the Morning Star Goddess of the Iroquois. A Quartz cluster may also be used to honor Ixcuiname, the Mayan Goddess of the Four Ages of Women. Clear Quartz is not a natural birthstone. Clear Quartz is a Seeker Transformer crystal. Seekers contain a crystal energy structure that aligns the natural energy of the crystal to the natural power of the human mind to find the way to new horizons and new capabilities. They're pointers, directors, and compasses; the fresh start crystals. These are talismans of the scientist, the adventurer, the hunter, wanderer and explorer. They're also crystals of the student and the researcher. Clear Quartz crystals are perfect "energy dispersers" in any window. As a natural prism, they take light and energy from the sun and disperse it freely within the room. They offer an indoor sun world for warmth, strength and vitality.